Altogether, Whitby Folk Week is a compelling reason for ignoring the 'Costas' and heading to the north east of England in late August each year. This long-standing celebration of the traditional music, dance and song of the British Isles has taken on the trappings of a tradition in its own right. With over 600 events covering workshops, concerts, singarounds, dances, sessions, street entertainment and the extensive 'fringe' events that blossom spontaneously, Folk Week is a festival that no lover of real music should miss. Whitby itself is filled with examples of our rich and colourful heritage. This picturesque seaport town has a greater concentration of visitor experiences per square mile than in many of the better-known tourist destinations. From the Jet Workshop to the Dracula Experience via Captain Cook's cottage and the ruined Abbey dominating the cliff tops above the town, there is culture and tradition in abundance. Folk Week could not have a better setting. For the 'inner person' there are many excellent restaurants, cafes and bars, real-ale pubs, and the best fish and chips in the northern hemisphere. And all this can be digested in the company of some of the finest musicians and singers in the British Isles. 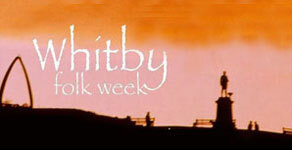 Whitby Folk Week has something for everyone and is something everyone should experience. But there is the danger that the rest of your life may involve an annual pilgrimage to renew the experience! Whitby and its family-friendly Folk Week can easily turn into your own personal tradition!